Aaron DeGroff, Blacksmith Shop, Ceres, PA.
Aaron DeGroff , Blacksmith Shop in Ceres, Pa. This is a photo of my grandfather, Aaron DeGroff, taken about probably about 1907 judging from the appearance of the boys in the picture. 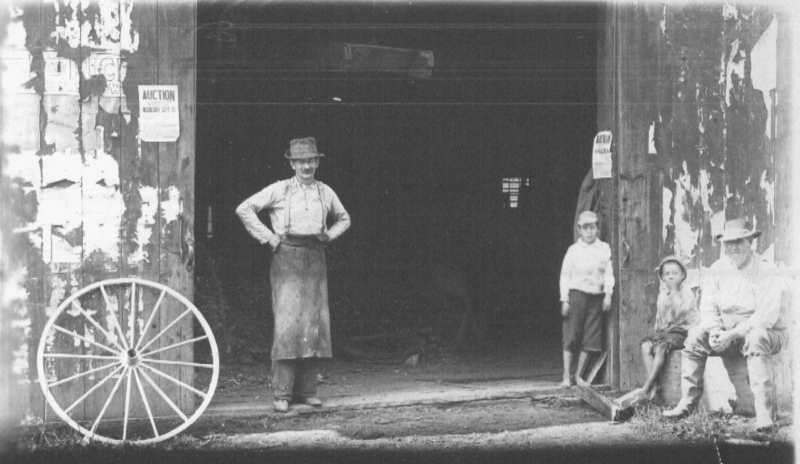 This was taken at his blacksmith shop in Ceres, PA,on the west side of the road just south of the old bridge. Aaron and his family lived on Low Street near the Boliver Road on the New York side of the border from 1901 to 1911 when they moved to Shinglehouse, PA. The boy in the doorway is unidentified, but may be his son ( my uncle ), Frank, who was born in Sharon Center, PA in June 1899. The man sitting to the far right is identified as Frederick D. Perkins, Aaron's brother-in-law (married to Aaron's sister, Harriet ), of Eldred, PA and whose occupation has also been listed as blacksmith. The boy sitting with him would be his son, Walter D. Perkins, born January 1898. Walter Perkins was killed in WW I at the battle of Meuse-Argonne, France, October, 1918.